“ All the more reason to not answer! !” laughed his friend in the wheelchair at the end of the dock. 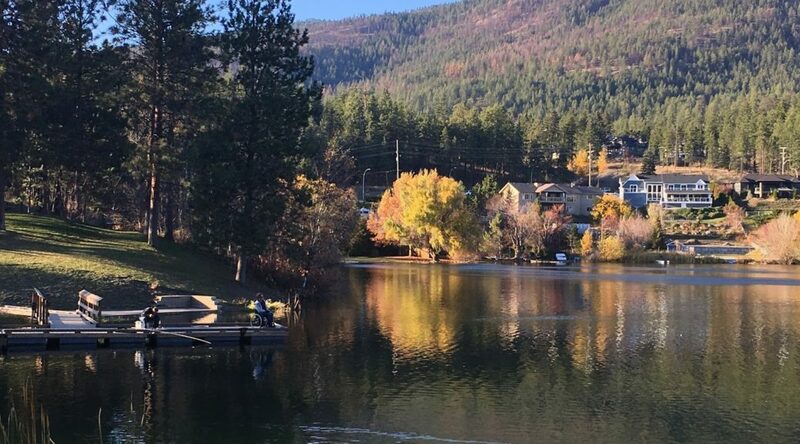 I overheard this conversation as I sat on park bench on the hill behind the dock and I watched the scene in front of me with with a sort of amazement… “this is what fishing is about” I thought. A man in a wheelchair on the dock with his immigrant friend fishing for bass using bait and bobber rigs; a father and son to my left, the father teaching the fundamentals of a roll cast to his son; two kids walking down the path towards the other side of the lake, school backpacks and lunch bags packed together with their spin rods and tackle box; a young man in his waders and belly boat wearing his worn in Patagonia hat and polarized Smith glasses working the drop off for trout with slow retrieve chironomids. All of these people were here, together, sharing the experience of fishing. I was at Shannon Lake, for those of you from the Okanagan, you will no doubt be familiar with the location. Within city limits, a small local lake with a park on one side, golf course on the other and houses in between. I am sure your community has some similar type of park/pond combo where fishing is laidback, central, accessible and public. I’m not sure what motivated me to go to the lake; I was bored, I was curious, I was feeling the sadness of not being able to fish the streams and lakes of the high country since the snow had set in. All these are valid reasons. Regardless of why I went there, I was really glad I did. I sat there and reflected on the fishing season that was. It was great, some awesome highlights, personal bests, new species caught, new basins explored! More than I could have asked for. The thing that struck me most about it though was that, at no point had it looked anything like the scene laid out before me. At what point did I stop pursuing this kind of fishing experience and why? I think back to my teen years and the many hours spent on Lake Bonivista in Calgary with my highschool buddy Andrew. We rowed around the small urban lake everyday after school trolling mepps spinners for stocked trout (Sometimes we would sneak some beers out with us hehe, sorry mom). We were rarely the only ones out there. Many others: old and young, boat and shore, fly and spin all enjoyed the same experience. These were some of the most enjoyable fishing experiences of my youth. 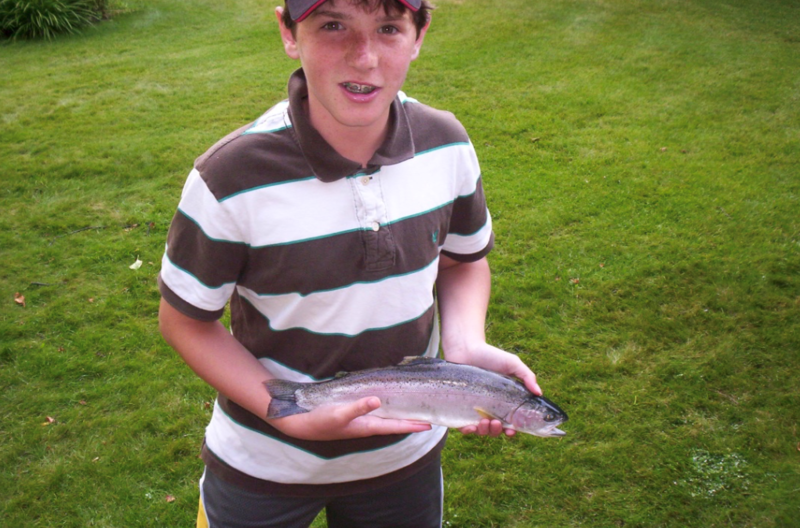 Enjoying a nice hatchery rainbow in the days of my youth. As I sat there watching the scene at Shannon Lake that evening I couldn’t help but feel guilty. I thought that this type of fishing was inferior? That these people were somehow lesser fisherman? I realized that I was the lesser fisherman. For years I had been missing out on this brilliant shared experience, catching fish, finding peace and making memories with people from all walks of life who are out there because they like to fish. The fact that I couldn’t see that made me upset. Maybe you can’t afford that $400 fly rod. Maybe you don’t have a 4×4 truck to take you into the backcountry. Maybe you don’t even own a vehicle and need to take the bus. Maybe you only have 2 hrs to go fishing. Or maybe you no longer have the use of your legs. And that, in my opinion, is pretty awesome. So, thank you urban fisheries! Thank you for providing an accessible and approachable option to anglers of all walks of life. The role that the urban fishery plays in developing the sport, and developing a society that understands and values the natural world is really immeasurable. Fishing turns people into conservationists. 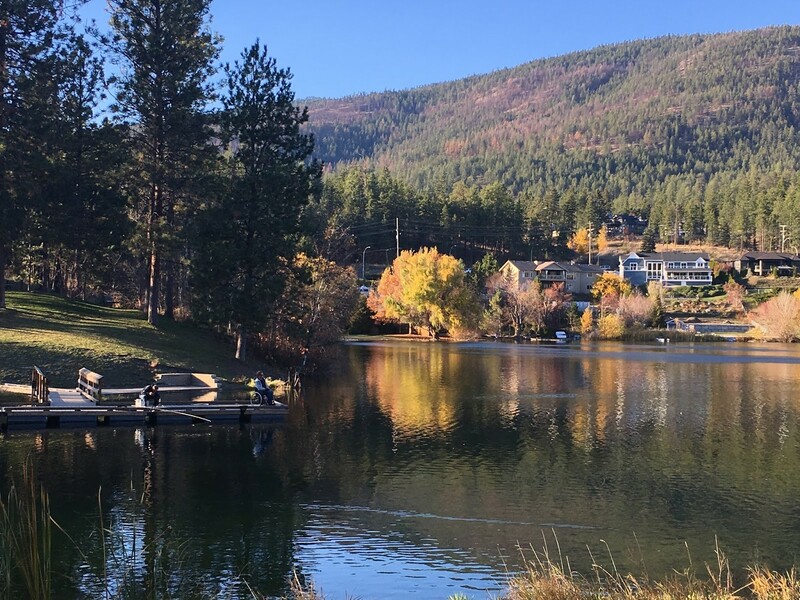 If you like fishing and want to continue fishing then you are undoubtedly a supporter of pristine waterways and healthy ecosystems. Living in a city makes it easy to fall out of touch with nature and to lose sight of the joy and value that it can bring to our lives. The urban fishery bridges that gap by providing city dwellers a glimpse into the beautiful natural cycles of nature as well as access to the fantastic and therapeutic pastime of angling. Lakes like Shannon are great. Having such a great fishery in an urban setting almost feels weird, but it’s good for those days when you don’t feel like driving and hiking for hours (or, say, at the beginning and end of the season when it’s the only open water left). Have you ever gone through the effort of putting a boat in there?